This post is sponsored by Holland House Cooking Wines. 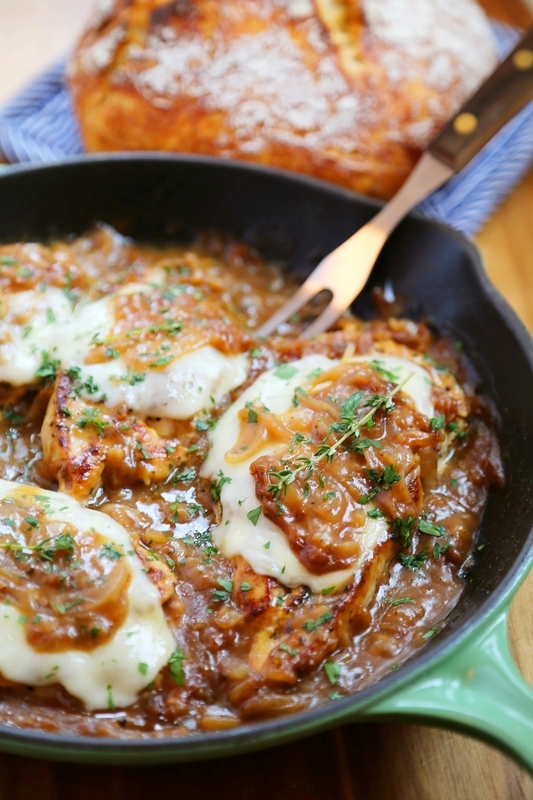 Saucy, melt-in-your-mouth French onion chicken smothered in caramelized onion gravy and topped with melted cheese? Yes, please. Serve with a green salad and crusty bread for an easy, impressive family meal! This is easily one of the BEST chicken dishes I’ve ever cooked! Every bite is so incredibly tender, sweet, salty and mouthwateringly good. 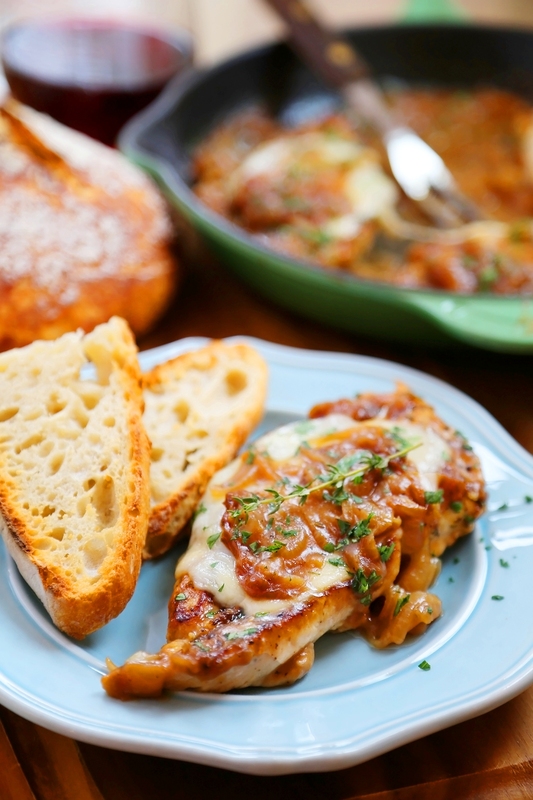 Combined with fresh herbs, rich caramelized onion gravy, and gooey, melted cheeses, this French onion chicken has amazing flavor in every forkful. 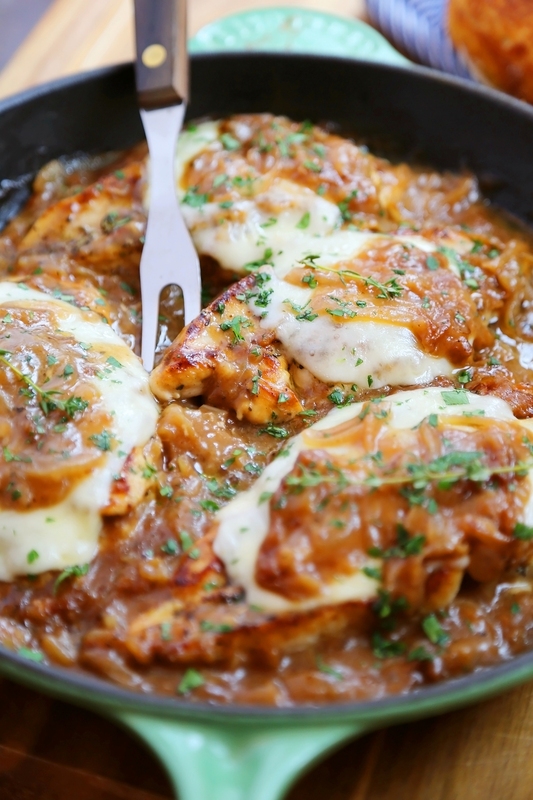 The ingredients are easy to find and straightforward, but create the most outrageously delicious, cheesy chicken made simply on your stovetop. Cue the happy groans at the dinner table! If you’re craving the goodness of classic French onion soup, but also want a hearty, family-approved dish, this 30-minute meal is for you! Easy and elegant, and oh-so-good for weeknights or even special occasions. 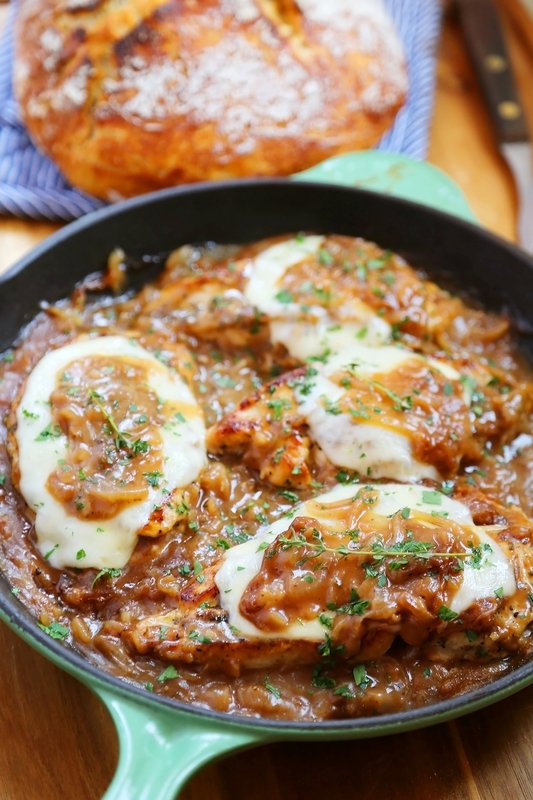 That’s this one-pan French onion chicken! For serving on the side, it doesn’t get better than a loaf of No-Knead Artisan Crusty Bread. All you need are three ingredients, and you won’t believe how quick and easy it is. 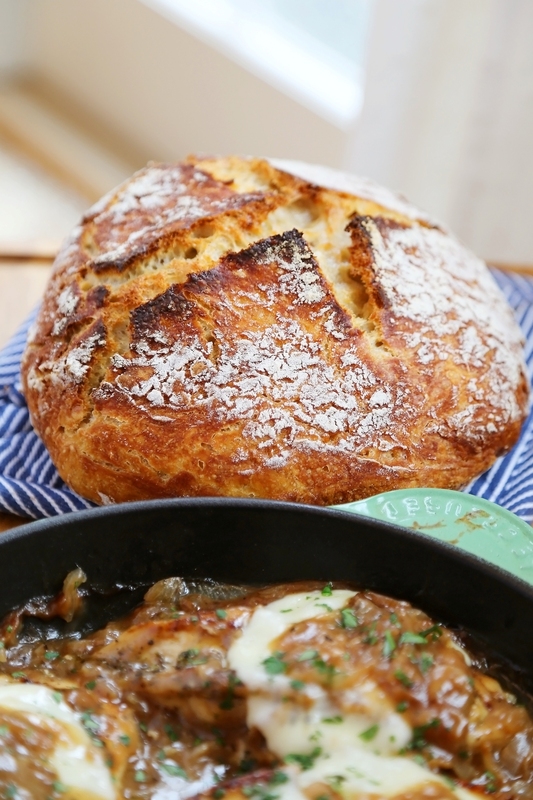 Perfect for mopping up extra caramelized onion gravy, and it makes a killer garlic bread. I also love to add a crunchy green salad on the side, when I’m feeling like being good (i.e., when others are watching). 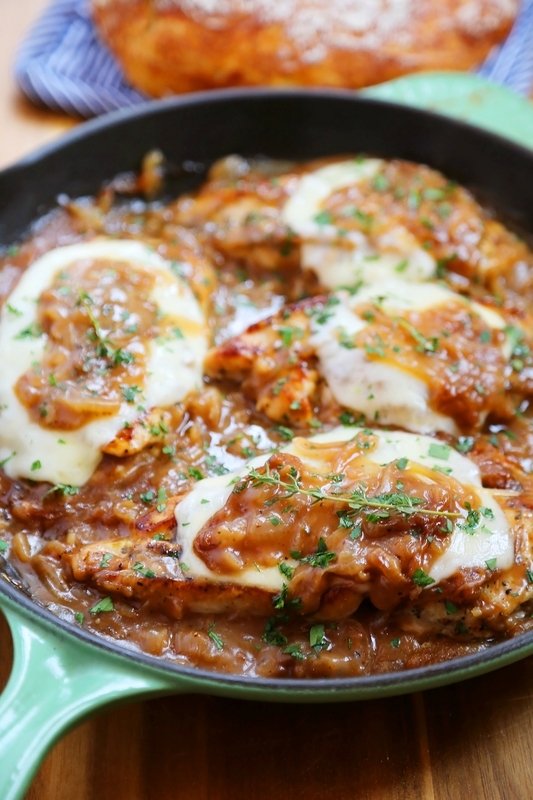 Let’s rewind a bit, though, and talk about how to cook your French onion chicken! Start with a hot skillet, adding butter and onions. Is there any better aroma than onions crackling in melted butter (answer: no). Pour in your beef broth and cook it down ’til your onions are tender and deeply browned. Remove them and add your chicken. Sizzle on each side to a gorgeous golden, then remove from your pan. Add your onions back in and cook in a little flour. 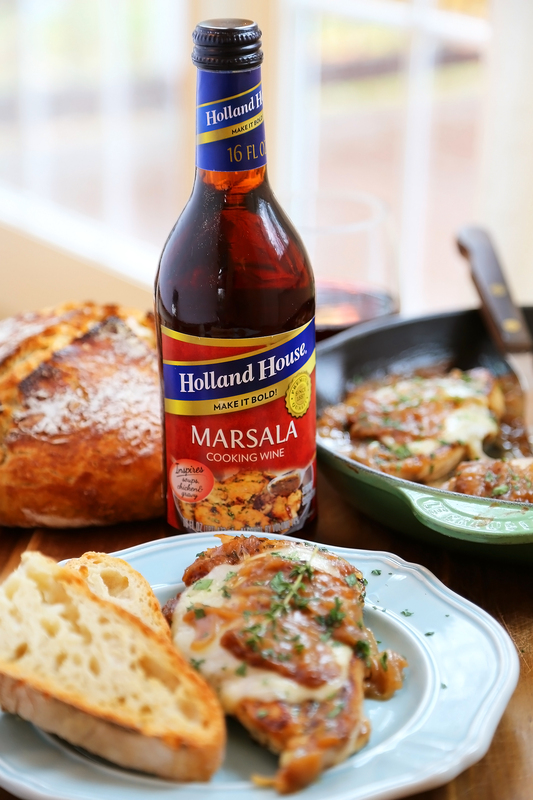 Pour in more beef broth and a splash of Holland House Marsala Cooking Wine, and let that sauce bubble! Can we rewind again? Because this cooking wine needs its moment. 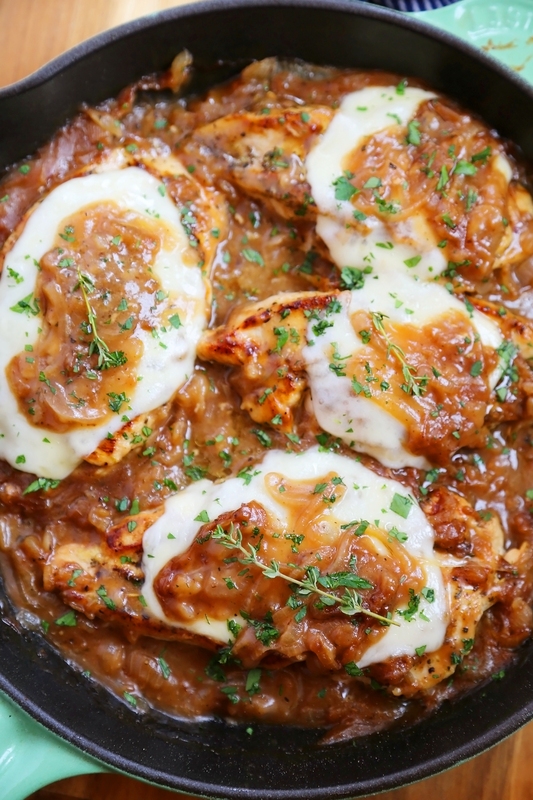 This Marsala seriously punches up this French onion chicken, adding subtle sweetness and depth of flavor. I love swirling it into soups and gravies, and in my salty Italian dishes that need a little flavor balance. It’s a constant staple in my cabinet! Pick some up, will ya? Here’s a coupon! If you find your gravy too thick, add a little water or beef broth to thin it out. 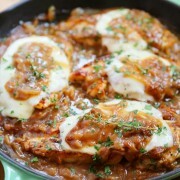 Now, nestle your chicken back in the pan, spoon on some gravy, and top with sliced cheese. Slide the whole thing into a hot oven, or transfer the mixture to a baking dish if your skillet isn’t ovenproof. 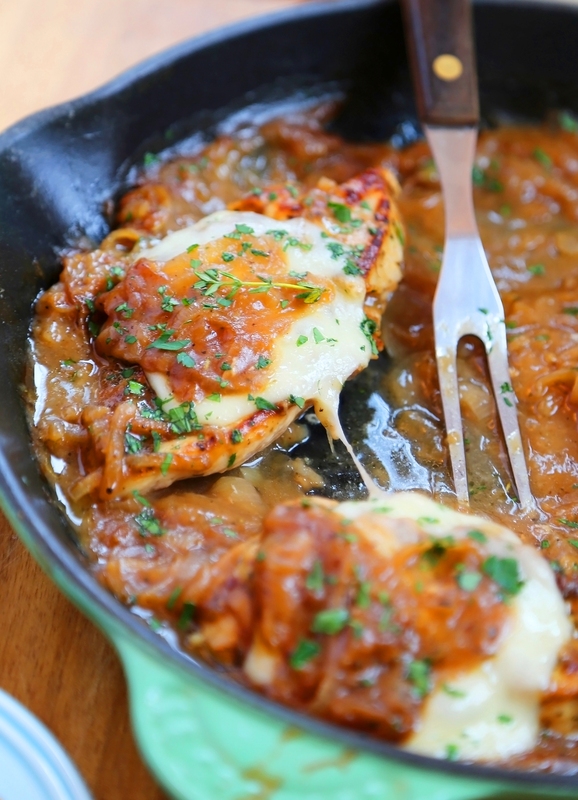 Let your chicken fully cook and cheese become melty, and then you’re ready to dig in to delicious, gooey greatness. All in under 30 minutes! 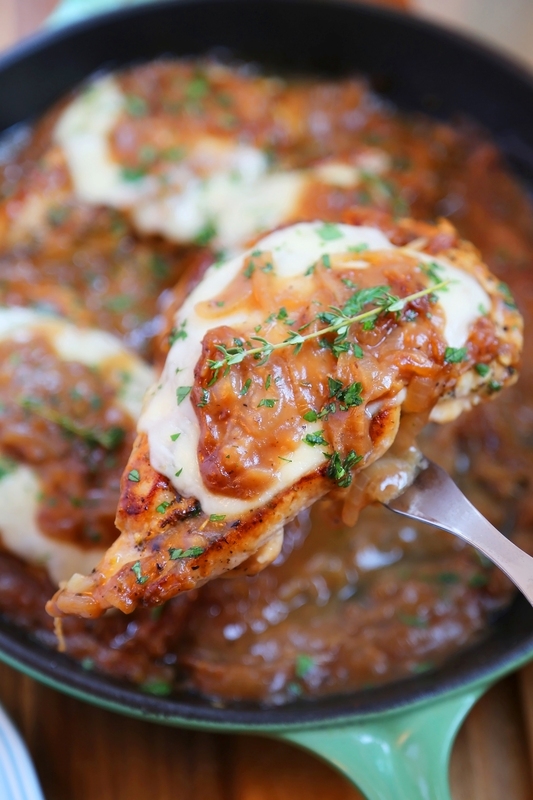 I know you will love this easy, incredible French onion chicken as much as we have. It’s the best stovetop dinner ever, and is outrageously good served with crusty bread. Melt butter in a large ovenproof skillet* set to medium-high heat. Add onions and 1/4 cup beef broth. Sauté onions, stirring occasionally, for 10-12 minutes, until deep golden brown and tender. Transfer to a bowl and set aside. Meanwhile, drizzle chicken with oil and sprinkle with salt, pepper and Italian seasoning. Arrange chicken in the empty hot skillet and cook for 3-4 minutes on each side, until browned. Chicken will not be fully cooked yet. Transfer chicken to a plate and cover; set aside. Return onions to the pan. Stir in flour and cook for 1 minute. Pour 3/4 cup beef broth and 1/4 cup Marsala into the pan. Bring mixture to a boil, stirring occasionally. Season with salt and pepper, to taste. Return chicken to pan. Generously spoon sauce over each chicken breast. Top each chicken breast with 1 slice of provolone and 1 slice of Swiss cheese. Transfer skillet to preheated oven. Cook for about 10 minutes, until chicken is completely cooked and cheese is melted. 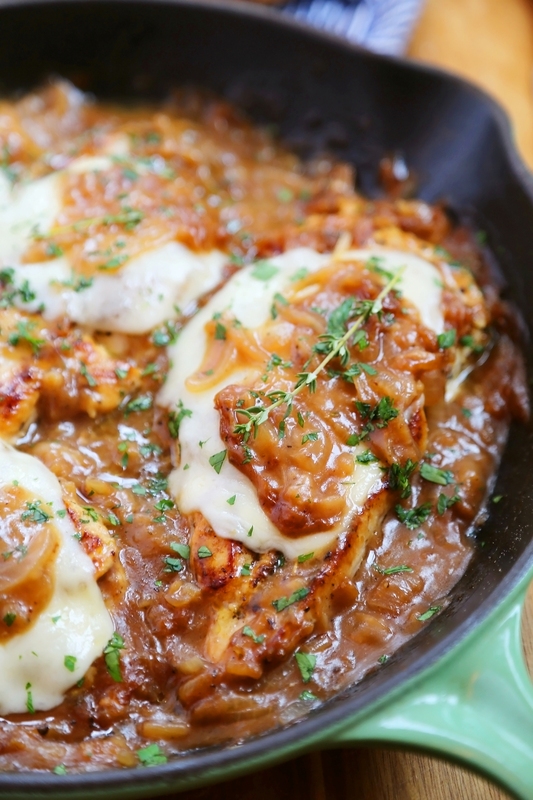 Spoon the caramelized onions and gravy over top of the chicken. Garnish with chopped herbs and serve. • If you don't have an ovenproof skillet, use a regular skillet first, then transfer to a deep baking dish to finish cooking in your oven.